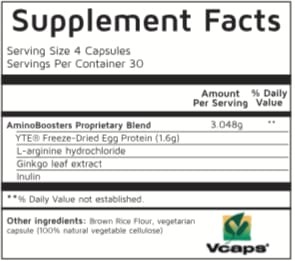 AminoBoosters contain full strength pure YTE® which is a highly absorbable bioavailable source of all 23 Amino Acids required by your brain and body. AminoBoosters has genuine YTE® at the right dose in our proprietary, powerful, natural supporting formulas - and always honest pricing. 60 capsules per bottle - 1 month's supply of AminoBoosters. 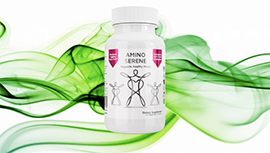 AminoSerene is the specific formula for Highly Sensitive People. "HSPs" are said to account for up to one quarter of the population now ... which is why, if you're HSP, you may feel so different to the 75-85% majority of people. AminoSerene is for individuals who can be overwhelmed, affected by mood disorders, who are sensitive, who think and feel more deeply. Improves psychological and endocrine stress, reduces blood sugar, cortisol, and fatigue, promotes positive mood and improves memory, with the power of extra YTE® and Sensoril® Ashwagandha, L-Citrulline, MecobalActive® B12 and complete B vitamin complex. 60 capsules per bottle - 1 month's supply of AminoSerene. Take AminoBoosters and AminoSerene together for Maximum Results. Discover the signs and symptoms of mood disorders, what to avoid, what to do - all in short mini-videos so it's easily understood. We're thrilled to bring Dr V's Recovery Pack to you at this special price. Discover the world-famous, genuine, pure YTE® amino acid complex carefully blended with top quality botanicals for a healthy response to cortisol, inflammation, anxiety, and the ongoing toxin-attacks faced by your brain, body, and soul every day. AND One More Bonus: FREE Premium Blueberries and Dark Chocolate - the two superfoods specifically good for your brain and mood! Dramatically discounted price: reduced from $168USD to just $119 today. To start “Getting Your Boom! 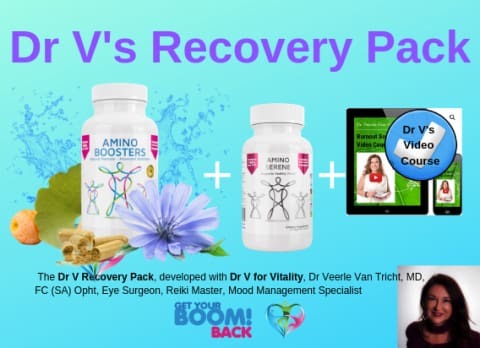 Back” with Dr V's Recovery Pack, click on the buy now button at the top of the page. Of course covered by our famous Worldwide 30 Days Triple Guarantee.